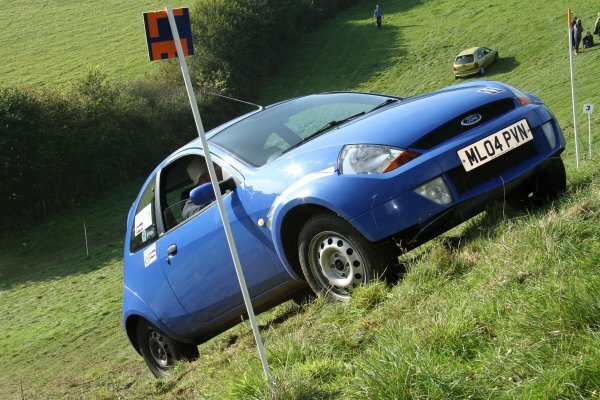 Held off-road, on mainly grassy hillsides, driver and passenger** (“bouncer”) skillfully persuade their production car to climb non-stop uphill in a series of tests – emerging from the top of the test being the objective. Successful crews will apply well honed techniques, to amaze the lay onlooker and all without the benefit or expense of a specialist car! To add to the challenges all cars have to use normal “summer type” tyres – Winter, M&S or Allweather tyres are not permitted. Many competing cars in Car Trials are in day-to-day use, be it the family car or one used in other motor sport disciplines – or both! **the passenger may be optional, subject to individual event regulations. Competitors favouring the standard car are amply catered for with a class for production cars first registered on or after 1 January 1998 and carrying no ballast. These “younger” cars are also eligible for one or two of the other classes, in which limited modifications are permitted within the Motorsport UK Regulations and the cars then invariably carry ballast to improve grip. For full details of the classes on BTRDA events, see the Championship Leaflet, and for the technical regulations see the current Motorsport UK Yearbook, section ‘T’ for Trials. The full championship rules in a more legible format are available here. If you are new to the sport, take a look at our “Short Guide to Car Trials” and for an in-depth study of the intricacies of Car Trials, see our leaflet “Car Trials Driving Techniques”. The Championship runs in conjunction with a dozen or so National B status club/regional events across the country, culminating in an end-of-season Grand Final Trial for qualifying competitors – those having contested at least five of the qualifying rounds. With league type championships running through the season, together with a unique end-of-season Grand Final Trial (with bonus points for the winner of that event), there is much to play for! Additionally, class awards and the Ladies Award are contested at the Grand Final only. If you are up to the challenge – join us today – we look forward to seeing you! Newcomers to the BTRDA under 25 on 1st January 2019 can join the Association FREE-OF-CHARGE.